Kris Bales is a long-time homeschool parent. 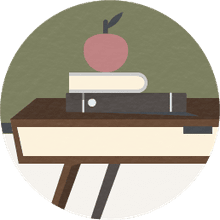 Since 2009 she has reviewed homeschool curricula for providers like Alpha Omega, Apologia, and All About Learning Press. The middle school years are a time of transition for tweens in many ways. There are obvious social, physical, and emotional changes happening with 6th to 8th graders. However, middle school also serves the purpose of preparing students for more challenging academics and greater personal responsibility in high school. For public school students (and their parents), the expectations in the first year of middle school can be an abrupt and demanding change. Instead of teachers communicating with parents about assignments and due dates, they communicate directly with students and expect them to be responsible for meeting deadlines and completing tasks. There is nothing wrong with that, and it’s part of preparing students for the middle school to high school transition, but it can be stressful for students and parents alike. Tales abound of late-night scrambling to complete a forgotten project that makes up a high percentage of a student’s grade. As homeschooling parents, we don’t have to institute such abrupt changes, but it is wise to use the middle school years to prepare our students for high school. One of the biggest transitions during middle school is preparing students to assume responsibility for their own educations. It’s during this time that parents should adjust their role from teacher to facilitator and allow homeschooled tweens and teens to take charge of their school day. Schedule regular meetings to hold your student accountable for completing assignments. During the middle school years, plan to schedule daily meetings with your tween or teen, transitioning to weekly meetings by 8th or 9th grade. During the meeting, help your student plan her schedule for the week. Help her break down weekly assignments into manageable daily tasks and plan for completion of long-term projects. A daily meeting also provides an opportunity to make sure that your student is completing and comprehending all of her assignments. Tweens and teens are sometimes guilty of pushing challenging concepts aside instead of asking for help. This practice often results in stressed, overwhelmed students who don’t know where to begin to catch up. Read ahead. Read (or skim) ahead of your student in his textbooks or assigned reading. (You may want to use audio books, abridged versions, or study guides.) Reading ahead helps you keep abreast of what your student is learning so that you're prepared if he needs you to explain difficult concepts. It also helps you to ask the right questions to be sure that he is reading and comprehending the material. Offer guidance. Your middle school student is learning to take responsibility for his work. That means he still needs your direction. He may need you to make suggestions about writing topics or research projects. It could be helpful for you to edit his writing or offer advice on how to set up his science experiment. You may need to write out the first few bibliography cards as examples or help him come up with a strong topic sentence. Model the behavior you expect from your student as you transition to expecting him to complete the projects independently. Middle school is an excellent time to help your student develop or hone her independent study skills. Encourage her to start with a study skills self-assessment to identify areas of strengths and weaknesses. Then, work on improving the weak areas. Middle school students should also begin using a student planner to keep track of their own assignments. They can fill in their planner during your daily or weekly meetings. Help your students get in the habit of including a daily study time in their planners. Their minds need time to process all that they’ve learned each day. As your student enters the teen years, begin engaging her in the curriculum selection process if you haven’t been doing so already. By the middle school years, students start to develop a sense of how they learn best. Some students prefer books with large text and colorful illustrations. Others learn better through audio books and video-based instruction. Even if you’re not willing to hand over the selection process to your middle school student entirely, take her input into consideration. Remember that one of the goals of homeschooling is to teach our children how to learn. Part of that process is helping them discover how they learn best. The middle school years also provide the perfect opportunity to test potential curriculum. When you find yourself in the position of needing to modify or change curriculum in high school, it's hard not to feel as though you've wasted an entire semester or longer. Instead, give potential high school curriculum a test-run in middle school. You can try the middle school version of the curriculum or use the high school version in 8th grade. If it is a good fit, you can put in on your child's high school transcript since high school level coursework completed in 8th grade counts toward high school credit hours. If it turns out that the curriculum isn't a good fit for, you can shop around and choose something more appropriate for high school without feeling as though you've lost ground. Because the middle school years are a time of transition, they naturally offer the opportunity to catch up on any areas in which a student is behind where you’d like him to be and strengthen areas of weakness. This could be the time to seek out treatment or learn the best modifications and accommodations for learning challenges such as dysgraphia or dyslexia. If your student still struggles with automatic recall of math facts, practice them until she can recall them effortlessly. If he struggles with getting his thoughts on paper, look for creative ways to encourage writing and ways to make writing relevant to your student. Focus on improving any areas of weakness that you've identified, but don't make that the total of your school day. Continue to provide plenty of opportunities for your student to shine in his areas of strength. Use 6th and 7th grades to observe your student. Start exploring his extracurricular interests and talents so that you can tailor his high school years to his skills and natural aptitudes. If he’s interested in sports, check to see what is available in your homeschool community. Often middle school is when kids move begin playing on their school’s sports teams rather than recreation leagues. Consequently, it’s a prime time for the formation of homeschool teams. Middle school sports teams for homeschoolers are often instructional and try-outs are not as stringent as high school teams, so it’s a good time for those new to the sport to get involved. Most colleges and umbrella schools will accept some high school level courses, such as algebra or biology, taken in 8th grade for high school credit. If you have a student who is ready for a bit more challenging coursework, taking one or two high school credit courses in middle school is an excellent opportunity to get a head start on high school. Make the most of the middle school years by using them to create a smooth transition from the teacher-directed elementary school years and the self-directed high school years. What Are the Risks of Dual Enrollment? How Can You Support High School Students with Dyslexia? What Are the Benefits of Holding Debates in Middle School Classes?